Everyday actions and community projects around the province are reducing greenhouse gases and increasing visibility on climate change. Researchers believe that what individuals and groups are doing to fight climate changing is having a significant impact. Eating less meat and taking the train instead of flying to holiday destinations may seem like small efforts but, according to environmental experts, those are exactly the kind of personal actions that have a significant impact on climate change. 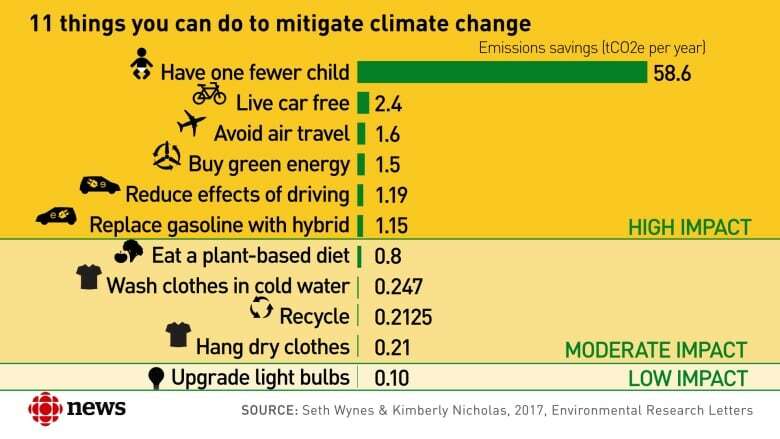 Seth Wynes, a PhD student at the University of British Columbia, researches the personal choices that have the highest impact on climate change. And then he tries to implement those strategies in his own life, giving up luxuries like cars and meat. "I'm lucky enough to be living in Vancouver. We have great public transit," Wynes said from the house he shares with three other roommates. "I try and eat a plant-based diet as best as I can." There's also a fifth way, Wynes added: Reach out to your local councillor. Write to your MLA. Vote. "Governments don't do things unless they think that voters are going to support them in that," he said. "We need to send signals to them." Smaller, seemingly inconsequential actions can also help reduce people's carbon footprints. Wynes washes his clothes in cold water and hangs them to dry in the summer, for example, and is upgrading his light bulbs as they burn out, to CFLs or LEDs. This winter, his thermostat is set low. But, ultimately, cutting out meat or avoiding airplane travel has a far greater impact on carbon emissions, he said. "A trap that a lot of people fall into is they'll do one small action and think, 'I do my recycling every week. Now I can take that long distance vacation over the ocean,'" Wynes said. "It's much more important to get the big things right." Wynes admits it doesn't have to be an all-or-nothing, militant approach — he still flies to visit his family in Ontario occasionally. Beyond personal choices, though, there are ways to become involved at the community-level. "We're not just one drop in a bucket, we're many drops," Wynes said. In North and West Vancouver, some homeowners are retrofitting their properties to be more energy efficient and getting discounts at hardware stores for insulation, window sealing and other energy-saving tools while doing so. "A key part is making it visible," said Stephen Sheppard, a professor and the director of the Collaborative for Advanced Landscape Planning at UBC's Faculty of Forestry. "When people see other people putting up solar panels or switching to EVs [electric vehicles] or walking to work, then it starts to happen. You just need to demonstrate that it can be done." How measurable are these initiatives? "It's still very early days, sadly," said Sheppard, who's involved with the Citizen's Coolkit to engage communities in climate change. He's optimistic about the future, but wants to see more government incentives such as tax credits, funding or grant programs or providing advisers to lend their expertise. "Governments haven't really stepped up to the plate in supporting citizen-led activities." But, he added, there are examples in B.C. of effective group action like after the Enbridge pipeline rupture in October, and FortisBC asked British Columbians to reduce their consumption of natural gas. "We've been running at less than 80 per cent capacity of natural gas for the whole of Metro Vancouver, which means that people have voluntarily conserved something like 20 per cent or more of their natural gas usage," said Sheppard. During the 2010 Winter Olympics, he added, Vancouver residents cut their travel by about 30 per cent to make it easier for visitors to get around the city. The voluntary move, Sheppard said, ended up saving energy and reducing carbon emissions. "We don't ask people to do that on a sustained basis," he said. "So we could do a lot better at that kind of thing."